David Furnish and son Zachary take a boat ride! Home » David Furnish and son Zachary take a boat ride! 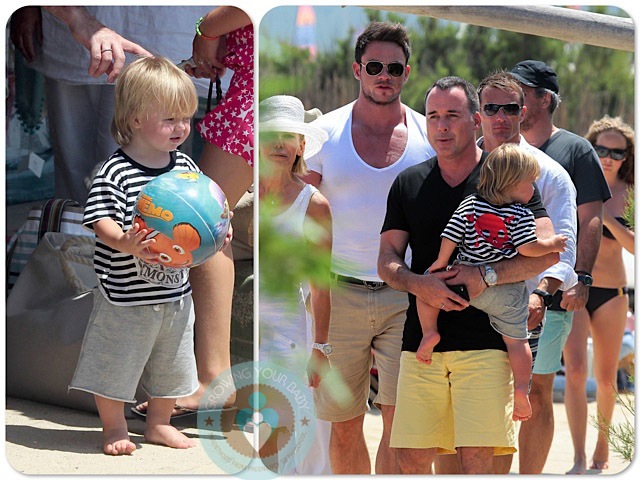 David Furnish, Canadian/British filmmaker and partner of famous British pop star Elton John, was photographed out with their son Zachary in St. Tropez at Club 55 on Saturday(July 29). The dad and toddler were having a grand old time playing around on the beach. Seventeen month-old Zachary sported a striped t-shirt, grey cut off shorts, red hat and a very stylish lifejacket, while papa David stayed comfortable in a plain black tee, splashy yellow shorts and aviator sunglasses for their boat ride with friends. The famous couple has a holiday villa in St. Tropez that they often share with their famous friends and kids. (Neil Patrick Harris and family spent time with them last summer) Elton was with his family for their holiday but was missing from their beach day as he was taking time to do television interviews promoting his newest book (Love is the Cure) and his latest album with Pnau.